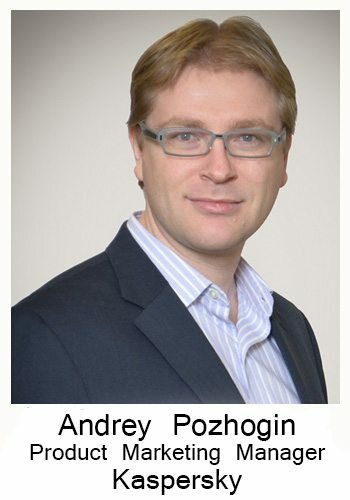 Andrey Pozhogin is the Senior Product Marketing Manager for Kaspersky Lab North America. Kaspersky may not be a familiar name to many small businesses. However, they compete with Symantec, McAfee, and AVG in the world of cyber-security software. When I asked one of my friends that works with an organization that competes with them, he described Kaspersky’s solutions as “very advanced”. During my interview, Andrey tried to answer all my questions directly, and was even willing to share his opinions on many topics. The Q & A below is reconstructed from my notes and do not represent his exact responses. Q: What is the top cyber-security threat faced by small businesses? Andrey Pozhogin: Small businesses do not view themselves as a target for cyber-criminals. 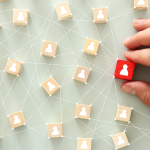 Because of the way small businesses typically use the internet, they are exposed to all threats that face the home internet user. They can unknowingly install malware on their computer or pick up a virus through seemingly harmless actions like opening a file or clicking a link on a webpage. In addition to the home-user risks, they can be the focus of very targeted attacks. If a small business has valuable customer data that can be exploited by criminals, they have a significant risk of being a target. The criminals know that small businesses have less security and threat detection resources than larger companies. Not only is it easier for the criminals to break into a small business, there is a higher chance that the business will not be aware that they have been hacked. This gives cyber-criminals more time to pull-off their crimes, like identity theft, without any counter-measures being taken. Q: What percentage of small businesses report cyber-security incidents? In Kaspersky’s IT Security Risk Survey 95% of small businesses reporting having a cybersecurity incident of some kind. However, 9% experienced at least one cyber-attack specifically targeting their firm. Q: Fit Small Business uses many cloud based services to store our important documents. In particular, we are heavy users of Google Docs and Sheets. Are we at more or less risk, as a result of using these applications? A: Provided you are not saving local copies of your documents, cyber-criminals will not be able to get access to your sensitive information or delete critical data via hacking into Google. Google and companies like Dropbox, encrypt data and store duplicate copies. However, this doesn’t mean that your data is safe. For example, your computer could get infected with a virus which copies your keystrokes, giving cyber-criminals your password. Unfortunately, there is not one catch all solution to being safe from cyber threats. There are ways that you can dramatically cut down the odds of an attack. 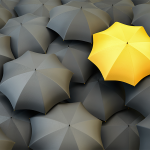 Q: What can a small business do to protect themselves? A starting point would be to have a unique password for every service and device where you keep sensitive data. If a cyber-criminal gains access to one of your passwords, you don’t want them to have access to all of them. While this may sound like a daunting task, there are password manager programs which make this easy. Included in many of Kaspersky’s products is a password manager. Keep your files encrypted. One major way criminals get access to sensitive information is stealing physical devices like phones and laptops. They can often circumvent needing a password for the device by removing the hard drive from a device. However, if you encrypt your files, they won’t be able to read them. Have a high-quality antivirus program installed on all your computers and devices. Kaspersky’s Small Office Security is a great choice for many small businesses. Q: What are the consequences when a business gets hacked? The average cost of cyber-incident is $720,000 according to our most recent survey. However, the cost to an individual company is going to vary according to a number of factors. For example, if the primary asset of a company is its intellectual property (an email list for an online media company could be an example) and that intellectual property is stolen or copied, the entire value of the company could be lost. As a Senior Product Marketing Manager, Kaspersky Lab North America, Andrey is responsible for product marketing and evangelization as well as sales and partner enablement, education and pre-sale support. Andrey brings more than eight years of both B2B and B2C product marketing experience to his role. 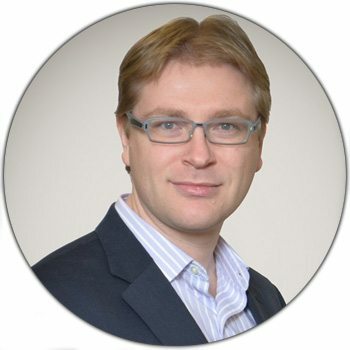 Prior to joining Kaspersky Lab in 2009, Andrey was a Product Marketing Manager at Microsoft Russia Server and Tools business group and an Industry Solutions Marketing Manager at Xerox Russia.